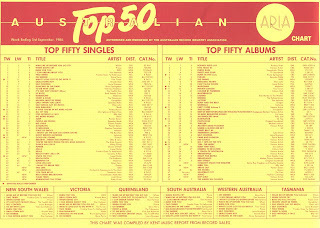 There were some big names behind the new entries on the ARIA singles top 50 this week in 1984. You had a male artist who'd topped the chart twice in the previous 12 months, an Australian rock group whose previous three albums had all reached number 1, another popular local band with a couple of big hits to their name... and so on. But as it would turn out, none of the singles entering the chart this week in 1984 would be very big - the highest any of them would reach was number 24. And a few of them have become long forgotten in the decades since. A song that could never be forgotten (and I'm sure some people have tried) moved back up to the number 1 spot this week. After making way for Prince's "When Doves Cry" for seven days, "Wake Me Up Before You Go-Go" by Wham! reclaimed the top position for a sixth week. And yes, I realise the chart above is dated September 3, 1984, but I'm assuming it's a typo given the ones before and after were dated August 26 and September 9. The singles either side did well, but for some reason this jaunty second release from Heartbeat City tanked. A change of pace would provide The Cars with a huge hit in a few short weeks. His last studio album yielded his biggest hit since 1975's "Girls On The Avenue", but Richard Clapton wasn't so fortunate with this lead single from Solidarity and wouldn't return to the top 50 until 1987. Their three other top 100 entries all peaked higher than number 15, but this follow-up to "Dance Hall Days" made a more modest impression. Not a bad song, but not great either. An Innocent Man had enjoyed a great run, so it's no surprise this video-less fifth single didn't fare so well. There was a sixth hit, "Keeping The Faith", in the US, but if it was released locally, it didn't make the top 100. Alas, the top 30 success of "Wood Beez (Pray Like Aretha Franklin)" would prove to be a one-off, with this and all subsequent excellent singles by Scritti Politti flopping locally. Eddy Grant had an excellent 1983, with his number 2 hit, "Electric Avenue", proving so popular it helped prior single "I Don't Wanna Dance" back up the chart to peak at number 21. 1984 hadn't got off to a great start, with the lead single from Going For Broke flopping, but things improved slightly when this song returned him to the top 50. It possibly would've done even better if it had actually been used, as intended, as the theme tune of the film baring the same name, which had been out for a couple of months in Australia. Some sort of dispute between Eddy and the movie's producers led to all but a guitar solo from the track being dropped from the film and "Romancing The Stone" not being included on the soundtrack album. Oddly, the original music video for the song featured footage from Romancing The Stone, although a second clip without any reference to the movie was also released. 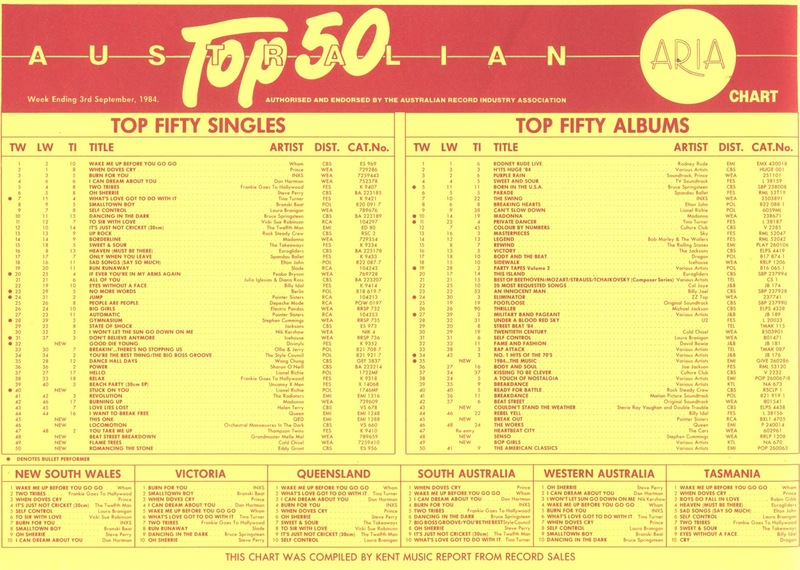 The failure of the title track from Twentieth Century had suggested it was as over for Cold Chisel on the chart as it was in real life. But they still had this track up their sleeve - a song that would turn out to be one of their most popular, in terms of enduring appeal if not chart position. Had the band known it would turn into a modern classic, I wonder if they might have put their differences aside to at least let singer Jimmy Barnes make a proper appearance in the music video... although, as we'll see next week, he had other things with which to concern himself by this stage. "White Lines (Don't Don't Do It)" had been a top 30 success earlier in the year, but despite Melle Mel getting full credit this time around, "Beat Street Breakdown" would only end up as a minor top 50 entry. The song was taken from yet another rap/breakdancing movie, Beat Street, which featured the group performing the song as well as appearances by a veritable who's who of the hip-hop world: Doug E Fresh, Afrika Bambaataa, Rock Steady Crew, DJ Kool Herc and more. By this stage of their career, OMD were onto their fifth UK top 10 single, but the synthpop band had never really taken off in Australia. And although they wouldn't land any really big hits for another couple of years, "Locomotion" actually did pretty well considering it only made number 30. Debuting here in its 11th week in the top 100, it would end up spending just shy of half a year on the chart. Easily OMD's most commercial single to date, it wasn't so well received by some British fans who liked their more artistic efforts. I had completely forgotten about this follow-up to "Everywhere I Go" until a couple of years ago when I saw it on a Countdown repeat during rage Goes Retro month - and although not as good a song, it showed pop band QED definitely had promise. Unfortunately, neither subsequent single "Solo And More", which peaked just outside the top 100 in December 1984, nor album Animal Magic made the chart and the band soon parted ways, leaving singer Jenny Morris to pursue more lucrative endeavours. Chart-topper "All Night Long (All Night)" had been followed by the number 24 single "Running With The Night", and so after another number 1 with "Hello", it was only fitting that Lionel Richie found himself peaking once more at number 24 with this latest single from Can't Slow Down. As well as being a big mainstream success in the US - it reached number 3 - "Stuck On You" also took Lionel onto the Billboard country chart for the first (but not the last) time. Although this would bring and end to Lionel's top 50 singles from Can't Slow Down in Australia, the album's chart career was far from over - it didn't drop out of the top 50 until November 1985. And so began the long, drawn-out process of Divinyls' second studio album, What A Life!, which wouldn't end up seeing the light of day until late 1985 after multiple recording sessions and producers. "Good Die Young" was the first single released from this period of the band's career, and while it put them back in the top 50 after the failure of "Casual Encounter", it didn't recapture the glory days of their first couple of hits. Like a number of other Divinyls singles - including "Sleeping Beauty", "Back To The Wall" and "I Ain't Gonna Eat Out My Heart Anymore" - "Good Die Young" is a song that has tended to fly under the radar in the decades since, but it's one that deserves more attention. After all, do we always need to hear "Pleasure & Pain" and "I Touch Myself"? Next week: the third and fourth biggest singles of the year debut - one, a soundtrack smash and the other, the solo debut of a singer who already knew a thing or two about massive hits. Plus, another group's frontman charts with his first solo hit. Another Billy Joel song I don't know by title, but know from the extensive airplay it received at the time. This one's not too bad. 'Keeping the Faith' was released locally in November. 'Absolute', 'Romancing the Stone' (the non-movie version) and 'Beat Street Breakdown' have all been aired on rage in the last few years. I otherwise wouldn't have known them. I've never seen the 'This One' video before. 'Good Die Young' is one of those song titles that became ironic later on, for the wrong reasons. I remember seeing the video on Countdown, liking the song, and thinking Chrissy looked interesting... though being slightly creeped out by the mannequin man (is that Paul Kelly?) whose hand smashes. And yes, it would be nice if 'Pleasure and Pain' and (especially) 'I Touch Myself' took a back seat to some of their less-heard material for once. ...ooh yeah, can we add "Science Fiction", "Siren" and the absolute classic "I'm Jealous" to that list of underappreciated Divinyls hits?